I guess since I am getting so many notices of people subscribing to my blog, maybe I need to post something new. While I do appreciate the occasional donation, that is not my mission. Remember that I say this blog is for education purposes, not correspondence, and I do not want to be repeating the same updates over and over again. I am going to repeat something here though: I am now only helping DIY types, mostly via email & phone. If you are not the DIY type, then you are on your own in finding somebody to help. Don’t ask. I am retired from doing installations and I will not recommend anybody. In fact, we are no longer traveling, after 13 years on the road. Occasionally I help a friend with some work on an RV system (especially fixing systems that were installed wrong ) and I am doing some off grid home work, plus a bit of home remodeling now and then, but that is it. I should be selling and shipping equipment but I live out in the hills where the Post Office doesn’t pick up so it just isn’t worth the effort. I am busy enough. We enjoy gardening, playing with the dog and working on completing our secret Montana hide out. 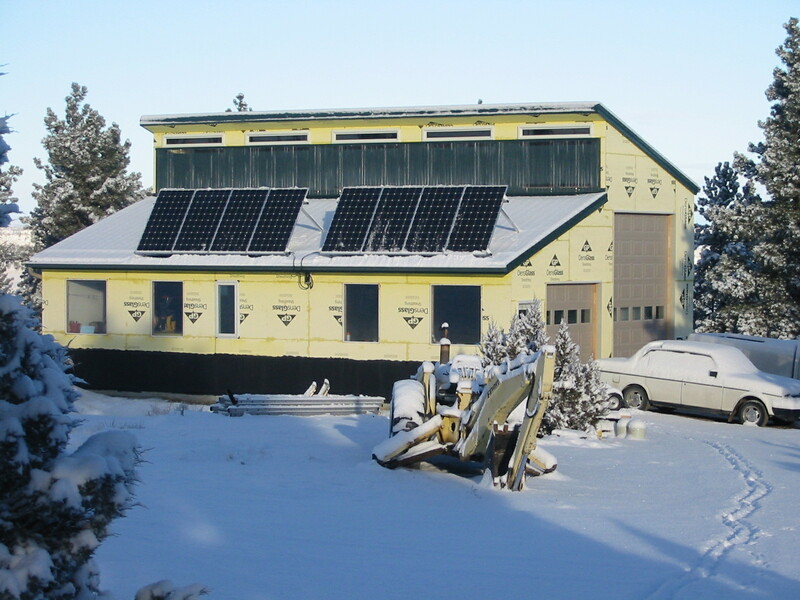 Here is what our barn looks like as of New Years Day, 2014. Our fifth wheel is parked inside. That thing you see on the clerestory wall is a solar air heater and it does work. This building stays above freezing with only 1” of foam insulation while the outside temp goes down below zero. Today it is 10F outside & 48F inside at noon. I will eventually improve the insulation but the goal of not having our pipes freeze has been realized. Do not look for me to be keeping the whole world appraised on the progress of our home building project. It is going to take years and we need some privacy. A solar powered & heated, rain water supplied, off grid home is in the planning stages. The heat will be supplied by a Trombe wall that faces slightly east of south for quicker morning heat. The honest truth about why it is taking so long is that we are financially challenged. We buy recycled things like doors, windows & sinks at the Re-Store. The trouble is that concrete, wood timbers and insulation are not cheap. This barn has over $6K of foam insulation in it. If you believe what the media keeps telling us about low inflation and how good the economy is, go price some 2 x 4’s, insulation or copper wire. 2×4’s have gone up about 45% in the last couple of years but nobody wants to talk about that. That’s right folks… I am not a liberal, even though I am poor. I worry about the future of America but I try not to make myself a target of the left. However, will somebody please go ask AlGore about the current record breaking cold weather all across the northern hemisphere that I believe is colder than it has been for about 50 years. A friend in Great Britain has been telling me about their weather this year. I was a kid the last time we had record breaking lows but is this global warming caused by man? The cycle has gone around and we are having a regular Montana winter here this year, as is most of the country. Two years ago we had record breaking snow fall. I know, I must be an idiot to not swallow all of that “Inconvenient Truth” BS. Sorry, I have half of a brain and I am old enough to remember the 60’s, when the doomsday experts were predicting that New York City would be under water by the turn of the century. People still live in Venice, Italy too. It floods annually, as it has for many, many years and while it may be deeper some years, the predictions were wrong. What about that ice breaker struck in Antarctica in the middle of the summer this year? There are some inconvenient truths for you, Mr Gore. Go buy some more carbon credits. Better yet, send the money to me and I’ll put it to real use building something that actually is good for the planet, not what your definition of green is. I know what your mansion looks like and how much energy it uses. Living like that while telling us paupers how we should live is Marxism. Shutting down US industry and coal production while China builds new dirty coal fired plants daily to power their production of things like lead painted baby toys and poisoned dog food is stupidity. We are all down wind from China. There, I did something that I said I never would but somebody needs to tell the truth. By the way, as I sit here the sun is shining we are using a 1000 watt electric heater to keep our rig warm. Having 2000 watts of panels up on the roof without a house to run from them makes this possible. No, we don’t use it at night. Regarding those panels; I bought Helios USA modules because they use 4mm glass, something that I think is the right thing in hail country. I have done two homes with them. Evidently not many agreed and most bought the cheapest Chinese things they could find. Helios is in bankruptcy…. So much for the warranty. I have gotten to the point where I tell people that a warranty on solar panels is only a worthless piece of paper. I am expecting even more solar panel manufacturers to go out of business as tax deals disappear and our tax and spend government searches for ways to tax solar power. Just you watch. WARNING (2017): Batteries do produce heat. The above box has proven to be too small for heat dissipation. I am leaving the cover off on warm days. Boxes need to be big and well vented. I would now say to have at least 1″ between batteries. 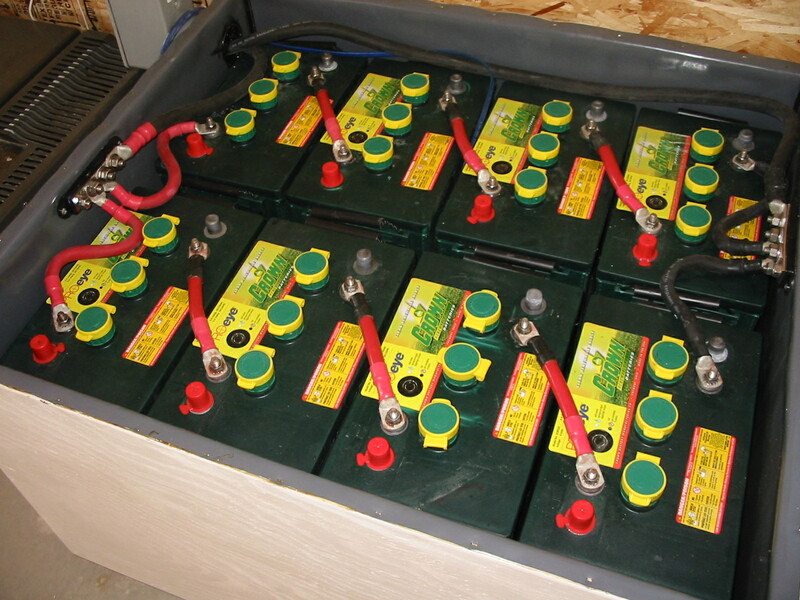 Here you can see our new batteries, Crown. https://www.crownbattery.com/ Crown is aggressively marketing to the alternative energy world with a brand new catalog and beautiful “green” batteries. Every time I look at their web site I find something new. Today I see they added something in the charging guidelines about up to 2.65V charging per cell (15.9V on a 12V system) being acceptable with shorter charging times. Just try to tell that to any of the RV Solar dealers. Read that “up to” again, because you could get yourself into trouble by just turning things up that high and not understanding the time factor. Don’t try it with the average battery made by the other guys. I am using 30.4V on my 24V system (2.53V per cell) for 3 hours and when I checked the fluid levels after two months of use I was only able to add about a cup of water in eight big batteries, so I get mighty sick of people talking about “boiling” their batteries. Of course this is temperature compensated and right now it is at 31V on a cold day. Overcharging is necessary to keep batteries in good shape and it is high time people realized even the battery manufacturing world is full of idiots who don’t know a thing about living on solar power. It is not the same as plugging a charger in overnight for your golf cart. Another thing; I am not going to comment on or try any new technology batteries until they have been in use for years. Please stop asking. Crown’s western regional sales manager and I have now been talking for quite a while about this. I believe he is the best source of truth in the battery world today. There are now five of these sales managers for the USA and they are expanding internationally. When I questioned him about this voltage over a year ago he said “Somehow I need to convince you that we really do build a better battery.” It took a while but I am convinced today. When Crown needed to expand production they bought a plant in Mexico and moved the equipment from it to an addition on their factory here in the USA and hired a bunch of Americans to run it. Just how unusual is this today? I bought (24) Crown 6CRP525’s (note that these are not the correct thing for RV’s) and when I put a volt meter on them, all tested within 1/100th of a volt of each other and they were FULL, not 75% or so like I am used to seeing. I have never seen this kind of quality control in anything except maybe Kohler faucets or Danish light fixtures from Louise Poulsen, both very expensive high end manufacturers. I don’t know what else I can say. I believe Crown to be the best manufacturer I have ever dealt with. Remember, I used to be a sales rep who sold for over 40 electrical manufacturers, so I do have some experience here. People keep asking the same questions, and they are mostly answered in my earlier posts, but since I keep having to repeat myself over and over, here is an attempt to cut down on my email time. Please stop asking me about this new controller or that one, or kits that have some cheap controller included almost free. Most of those are aimed at the rig parked in the yard, not for living on solar power. Unless somebody wants to send me one for testing, I am not going to experiment and I will not comment on things I know nothing about. I have a box of controllers that didn’t work, that I replaced with things that I know do work. Morningstar works as long as you buy a SunSaver as your minimum. Also stop asking about battery chargers but let me know if you find anything that works. Most do not even publish voltage specifications any more since moving their production to China. My advice is either buy a Magnum or use solar power. Please stop asking me about converters made by those big companies who sell to the RV manufacturers. I know they are claiming to be better and they have turned the voltage up a bit but you need to read the fine print. NONE of them stay at bulk set point voltage long enough to successfully charge all the way up and ALL of them rely on you being plugged in overnight or even for days, hoping float voltage will top you off. They can be used for back-up charging but are not suitable for boondocking and generator charging. They also refuse to add temperature compensation, which is needed to charge cold batteries. I have emails from those manufacturers on file that people have forwarded to me, showing very clearly that those manufacturers believe they know more about charging batteries than the battery manufacturers do. One recently told somebody that temperature compensated charging as recommended by Trojan will damage RV electrical systems. Well, I have been using those voltages for over a dozen years (the last three days have been at 15.2V in April after moving the rig back out into the yard) and my frig and water heater control boards both still work, making me very lucky or stupid according to them. Sorry people, they really do intend for you to be plugged in at a park. Until somebody who lives in an RV off grid develops a new charger we are stuck with things that do not work. Buy a Magnum, disconnect the AC to the converter and leave it in place for when you decide to trade rigs and you want to take the Magnum with you. Also, please stop asking me about disconnecting one charging source when another is working. There are thousands of motor homes going down the road with two and three chargers all connected at the same time. They push against each other, but nothing blows up. Do not ask me to draw diagrams, especially if you intend to hire some RV guy or electrician to help you. If you cannot do you your own diagrams you probably should not be doing your own wiring (it can be dangerous) and the chances of having somebody else install working solar is pretty poor. If you want your solar to work you need to learn enough to do your own diagrams, which I will gladly look at. Realize that there are too many variables and I cannot keep getting involved in long drawn out discussions on the various ways to hook things up in rigs that I have never seen, it is a good way to get myself in trouble. Do not ask me to recommend any installers. I have not yet found one that I can trust to do it right every time. When one particular guy announces the recall campaign to fix all of the things he did wrong in the past he might get my recommendation. Another might get it if he stopped lying to people about Trimetric not being the best battery monitor available today. Do not hold your breath. BIG NEWS: Bogart Engineering will soon be releasing the smartest RV solar charge controller ever made, the Trimetric 2030. It is a small thing, not pretty, just the best thing for the majority of RV’s, not those huge, crazy, all electric rigs. This will use a smart meter for the brain to tell it what to do. The controller is an ugly box that you hide away as close to the batteries as you can get it. It is also PWM, not MPPT. Ralph Hiesey, genius inventor, has lived off grid on solar power for longer than anybody else in related businesses and he knows the truth about MPPT not making sense on small systems. The companies that try to tell you MPPT is needed just want your money but Ralph is too nice and politically correct to come right out and say so. Look here: bogartengineering.com Realizing that this controller is going to change what I say today, keep reading. By the way, this may be right on time. I have been hearing from more & more people who are complaining that Morningstar seems to be having some issues. It might be a temporary thing and I hope so, but it is unacceptable that people cannot talk to a service tech when they phone and are told it might take 2 or 3 days for someone to get back to them. These issues need to be addressed. NOW! You can tell them I said so. Just in case you don’t know, see what happens when you click on the above picture. Here is what I would recommend today for a camper. By camper, I mean a rig that is not lived in full time, one that sits in the yard between camping trips and has a chance for the solar power to catch up when the rig is not in use. For this, a Morningstar ProStar with it’s 14.4V factory setting plus the built in temperature compensation and monthly light equalization works well. It also works well on AGM’s when you set it for flooded, once you figure out that it does exactly what Life Line now recommends. On smaller systems, a Sunsaver works as well. The circuit breakers you can see on both sides of the controller are stereo breakers from uneeksupply on eBay that work fine in this application. The big white box is a brand X inverter that I would never recommend but when somebody gives me one for free (thanks Alex), I recycle it to a deserving party. In this case my best friend for over 40 years. With this box he can carry an electric chain saw (but no generator), just so he can mess with his camping buddies. You can see the big 350 amp fuse for the inverter and the 500 Amp shunt for the Trimetric 2025 meter that is up inside. (Yes, even a camper deserves a real meter. Read my Nine Golden Rules.) On the shunt you can see the additional negative and ground wires that used to be connected at the batteries out on the tongue. 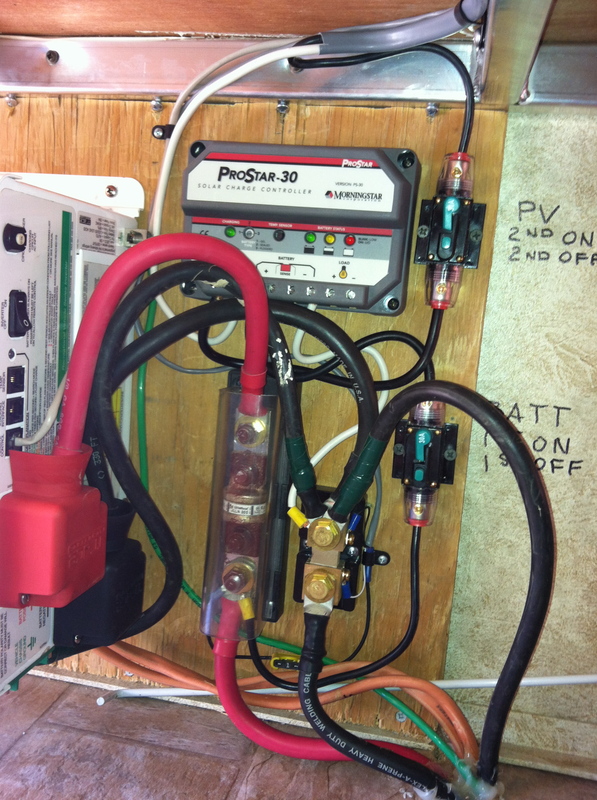 Look at the Trimetric Installer’s Instructions before and after diagrams, read all of the notes and just maybe you can do something that no RV tech I have ever dealt with has done: Wire it right the first time. On the roof of this little trailer are two 158W panels, do not ask me whose because I will no longer recommend them. I am sick of dealing with idjits. Shop, shop, shop. Here is what I recommend for a full time rig. This is another fairly small trailer and it has two Crown CR-260’s on the tongue, plus the same DM panels on the roof. Notice that the solar wire is #8, sized for the amps from two panels, not #4, because that would be wasteful on a small system. That #8 is terminated in MC connectors so that “Y” connectors could be used on the roof to tie the panels together (no box needed). You can buy #8 MC cables but you do not need them when running from one panel to a combiner box on the roof. Here is a voltage drop calculator that I have used a lot: http://nooutage.com/vdrop.htm If this link doesn’t work, just Google voltage drop calculator. In the pic you see the Midwest Industries 60A double pole fused disconnect that I like (the fuses are regular NON or FRN, 250V rated & they work fine on 12VDC) and the Morningstar Tristar PWM controller (with optional remote temp sensor) that can be set for the correct 14.6 – 14.8V charging needed when full timing. 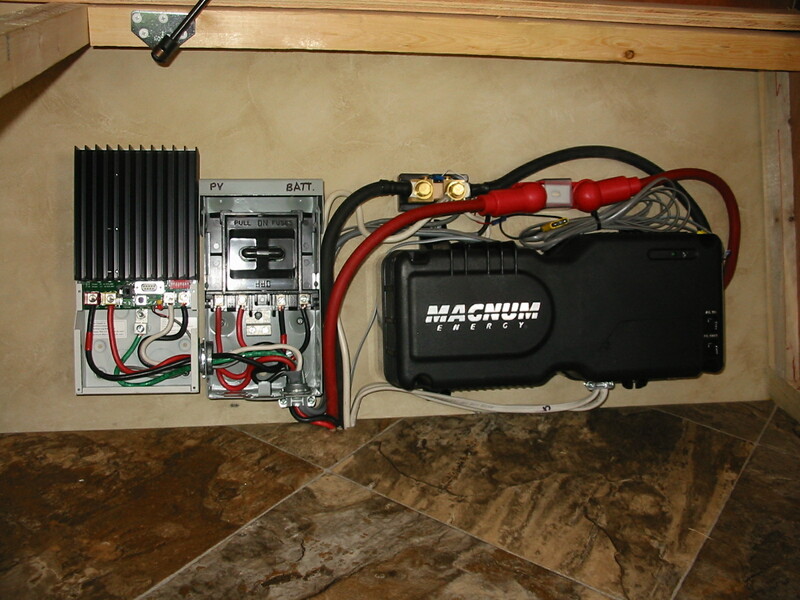 Next to it is a Magnum MMS1012 inverter charger, fed from a 200 amp ANL fuse with #1/0 cables. It gets AC power from a 15 amp breaker in the AC panel and then feeds back to both original receptacle circuits that are tied together. You cannot power a microwave with only two batteries, so that is not hooked up. The only warning here is that the circuit breaker in the older MM units limited how much could be plugged in, even when on shore power. No 1500W electric heaters or hair dryers. Magnum did fix this by changing the transfer switch to a 20 amp and the circuit breaker to a 15 amp, so if you feed the input from a 20 amp circuit it will have excess energy available to power the charger while passing 15 amps through.. Just be careful about buying old stock. 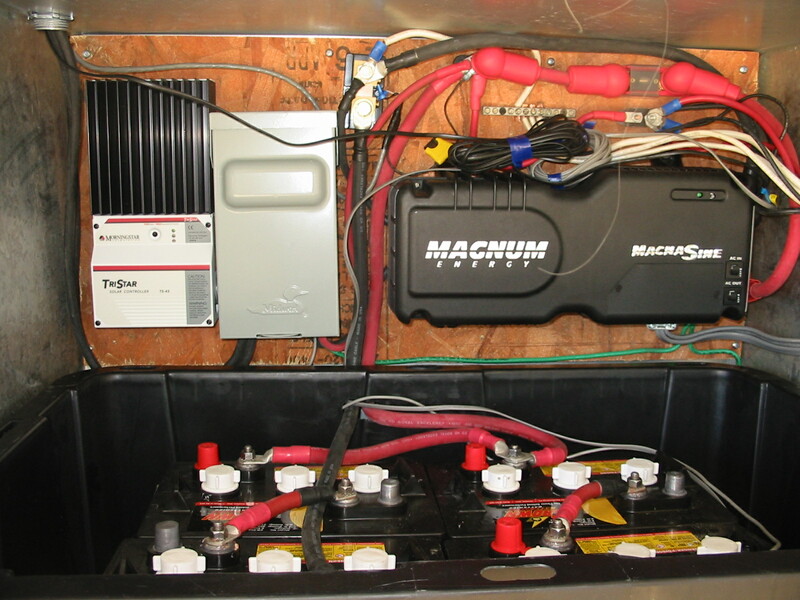 This is the same basic set up, but this is on a bigger fifth wheel and these folks wanted to have more power, so there are 4 panels on the roof (632 watts) and you can see the 4 Crown CR-260’s. Before you ask; Yes, the battery box lid has been removed so you can see and it is vented to the outside. The wire from the roof is #4. The big cables are #1/0 as recommended by Magnum. The owner of this rig is a software developer who spends many hours per day working on his computer, so he needs more that just two panels. With 4 batteries they can go many days between full charges. Again, systems this big might take advantage of having a Morningstar Tristar MPPT for winter time boost and if the bigger high voltage grid tie panels would have fit on this roof we may have gone that way in order to be able to use smaller wires down from the roof and have the controller supply the voltage needed by the batteries. On very big systems I would even consider a MidNite Classic, but be forewarned…. It is BIG and it contains two fairly noisy cooling fans. MidNite also seems to have problems making their computerized things work as intended. It is not going to be the right thing in most RV’s. As far as the new Kid goes, I would say “buyer beware”. If he had wanted to be able to run a microwave that inverter would have to be a 2000W. Many folks are figuring out that microwaving kills the food value and even with 600 watts of solar, you cannot do much more than reheat soup or make popcorn anyway. We took our microwave out and will not be putting one in our house. Cooking is something that takes kilowatts, not watts (just like an air conditioner or heater). There used to be a noisy 4.5KW propane generator in this box. After spending the summer traveling in the rig before putting solar on and hardly using the generator, it was decided that the generator was much less important than originally thought. Batteries are more important to boon-dockers and where to put them in an over loaded rig is a big issue. If air conditioning is needed it is cheaper to pay for a spot at a park than to carry, maintain and fuel a big generator. Generator supplied electricity is the most expensive on the planet. In the unlikely event that back up charging is ever needed it can be done with something like a small, quiet and light Honda instead of the big, heavy noise maker that the RV factory installed. So, what happened to the noise maker? Here it sits waiting for me to build a place for it, run propane & electrical lines. My friends traded it to me for some help in getting their system up & working. I will be able to run my welder with it and it may come in handy some day when I have a problem. It pains me to say this, but I could have used it recently when I suffered a charge controller failure due to a temp sensor failing inside my MidNite Classic and they had to send a new one. I lost several days of charging due to a weekend hitting at the wrong time. It took me almost two weeks to catch up during the shortest days of the year, with nearly constant snow storms. However, we did catch up without needing a generator while still acting like we are plugged in. We would have had a problem if we had been running an electric fridge. It is now time to say that LED’s are finally ready and that we have been using them for two years. With our rig parked inside of a barn for the winter it is dark and we leave lights on all day long. 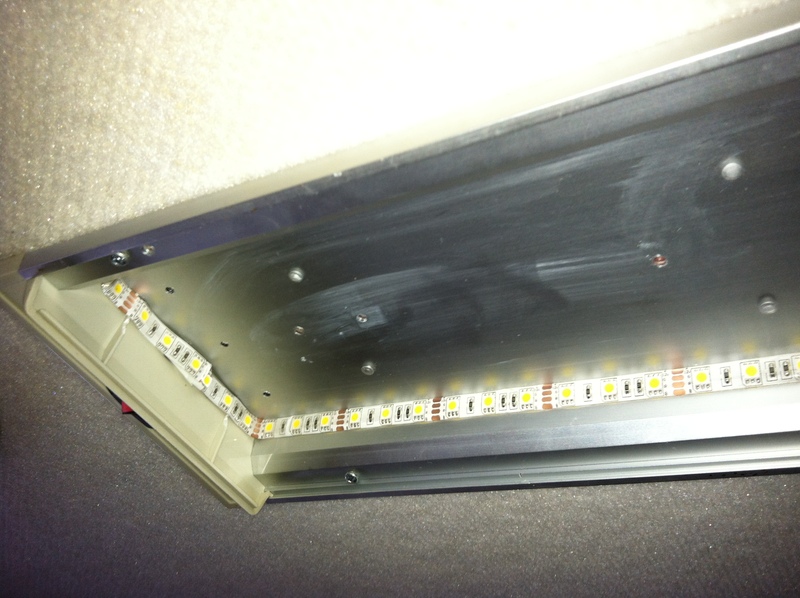 I retrofitted the fluorescents with strips of 12V LED’s as you can see. Not enough to duplicate the light output, just enough for comfort. 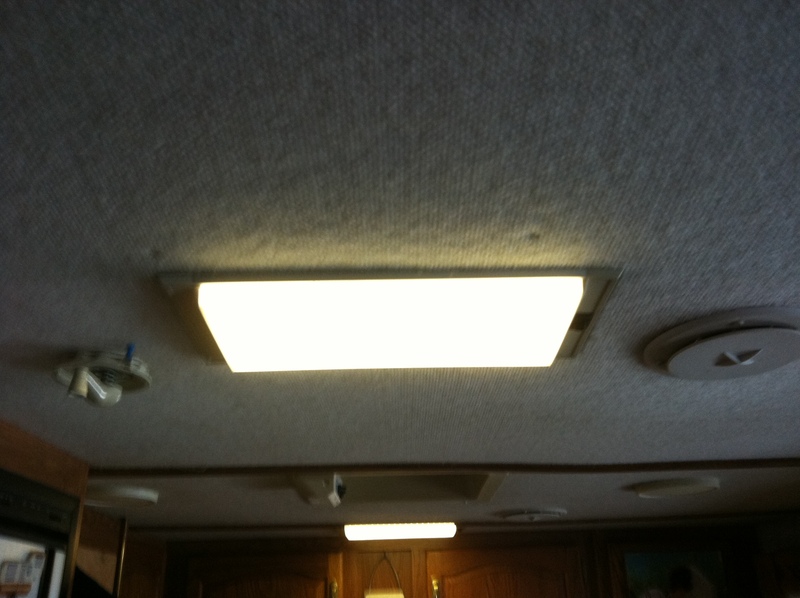 All of the other RV fixtures were fitted with retrofit lamps from eBay. I found an eBay seller who has done the research and found lamps or adapters for virtually everything. People keep bragging to me about how they bought LED’s from China and figured it out for themselves. For me, it was worth buying from somebody who did all the work and supplies quality products. Buy warm white LED’s. Many people ask about electric residential refrigerators, usually after they bought one and figured out that their solar could not keep up with it. A solar system that just “sort of” works will suddenly be shown for what it is when you add a big load. My favorite quote about this was from a British friend who told me “my charge controller has been fooling me and making a fool out of me for the better part of 4 years”. However, that is not what I need to say. A friend with a bus tried a 12V household refrigerator and had problems with it. He is now the proud owner of his second Energy Star rated 120V unit. Many people are finding out that the warranty is void if used in an RV. Why? I have a theory that I cannot prove, but think about the gyroscopic effect on a lightly built compressor motor that was never intended to be run while in motion. Maybe if you would shut it off when traveling?? After much deliberation and research I decided to buy an Amish built cooling unit for our 16 year old propane fridge here: Pines RV- http://rvcoolingunit.com/ They sell heavier built replacements that solve the fire problems and rebuilt units for when cost is the issue. David Force there is not easy to get on the phone because he is a busy man. However, he is a great guy and supplies knowledgeable advice, pages and pages of great directions, plus everything needed like the thermal mastic and expanding foam in kit form. 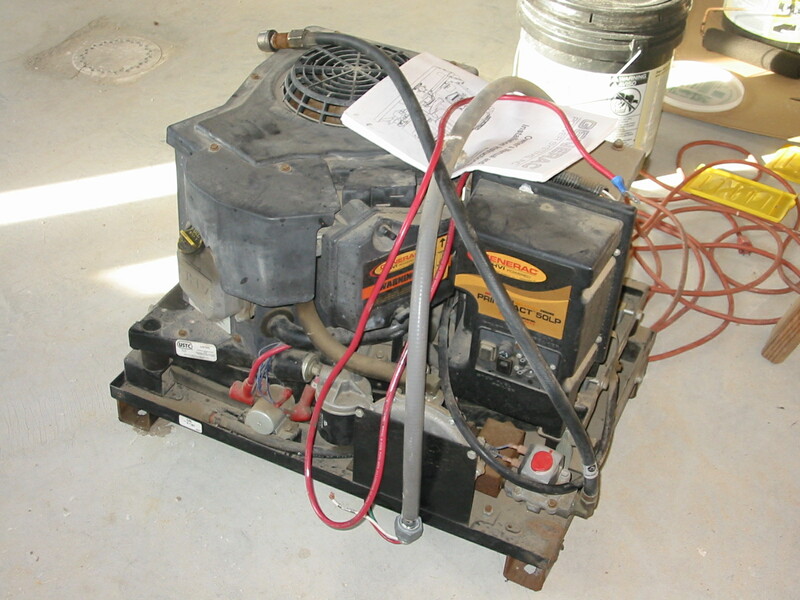 Any handy guy can replace his cooling unit in a propane fridge with a bit of help for the heavy lifting. It is not the mystery that the RV dealers would like you to believe. David told me that DIY guys who read the directions do a better job than the typical RV tech. My experience with them doing solar and ignoring the directions there makes me say “DUH” to that. Sorry, we didn’t take any pictures but my wife and I did it in just 4 1/2 hours, including adding a bunch of insulation and cleaning up our mess. It works better than ever because we did a better job of installing than Norcold had. No wonder it never seemed to work right. Pines refunds $100 when they get your old unit back & they pay the freight. Pines also sells fan kits. I built my own of course, but they have things figured out and their prices are very reasonable. David is not paying me but say hi for me anyway. 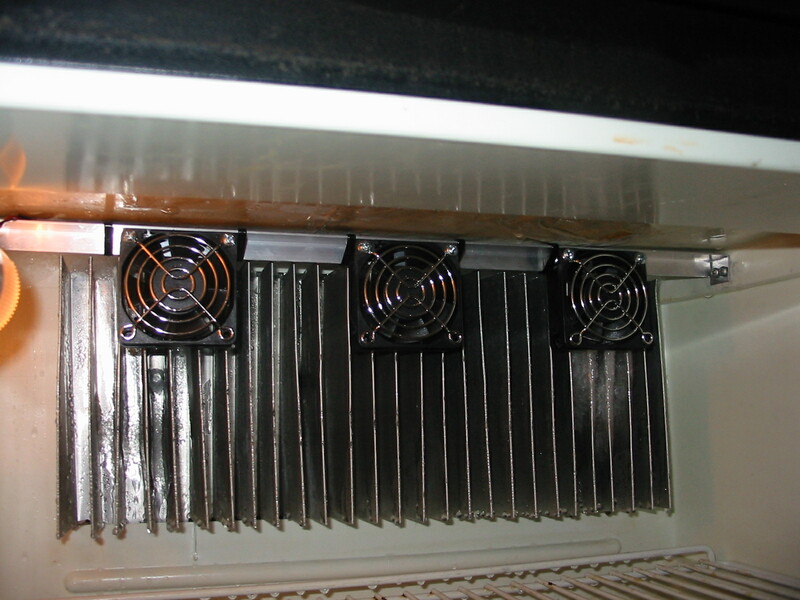 This set of 2” fans on the cooling fins inside the fridge vastly improved the cooling and has done away with the ice build up problem. We will never need to defrost again. Another 4” computer fan is in back at the top of the vent, controlled by a thermostat that came with one of those kits. The propeller fan in that kit did not last for one year. This fan has been running for at least ten years. Look for ball bearing fans on eBay if you want to build your own. My favorite seller is mynewfan. I have bought from them several times, including 5” 48V fans for my barn’s solar heating. Five different toilets in 14 years. I realized that I have probably spent nearly a grand on toilets…… This is the real world folks. RV toilets are all pretty much “crap” for full time use. We have owned three Thetfords and all eventually had leak problems. I am talking about excrement leaking out onto the floor from up inside where they have a joint and soft gasket, disgusting. I have taken them apart & sealed that gasket with silicone caulk, what fun. Believe me here; If you can smell it, it is leaking bacteria into your air. No amount of perfume is going to fix that, so we have never used the tank additives. Also, anybody who tries to tell you that the additives or enzymes do any good in the short period of time your poop spends in the tank is being foolish. We also have never paid for special RV toilet paper. Put a couple of sheets of single ply Scotts in a glass of water and watch what happens to it. Try the same with that quilted stuff you like so much and then think about what you are going to do when a glob of it gets stuck in your valve. Go ahead and risk it, but don’t complain to me. I don’t know how many times I have said that HandyBob does not work on black tanks. Anyway, enough of that. I believed what I had read in forums about the Dometic 310 toilet and bought one. I am sick to death of people posting on whatever subject when they do not have enough experience to know what they are talking about. Talk about your Mercedes after you have 100,000 miles on it, not right after you bought it. Be aware that the spring never was strong enough in the 310 and when the flapper breaks (and it will), you cannot get parts. Right out of warranty they would do nothing for me. As much as it pained me to do so, after much shopping and comparing, I bought a Dometic 510H to replace it. Too heavy and expensive but so far so good. Parts are available, if you can afford them. They are cheaper than buying four new toilets. More & more people are telling me about composting toilets. Don’t ask me because I don’t know. Our home will use recycled grey water from the shower to flush the toilet. Less impact on the septic system and zero impact on the use of rain water. That makes sense to me. Then again, I hear that common sense is now a recognized super power.